These recordings took place between 2003-2004 and were released through Blue Sector. Aural Hypnox re-releases the album in 2014 within the Stellar Mansion series. There are seven tracks manifesting in sound form seven dreams, each one captured “under the guidance of awakened subconscious forces”. Everything that is manifest draws its essence solely by mutual dependence; taken individually each thing is nothing. This illuminating though of Nagarjuna came in mind as a reactionary jumpstart that could serve as guiding line for the drifting in the realm of “Se Its En”. The whole is pervaded by fluctuating energies that every locus possesses up to a certain level. The dreamers enter a privileged state of being, without which the “Solar Horn” can’t be blown. As we hear the first dream’s auditive configuration (Solar Horn) , a certain mental reconfiguration happens imperceptibly. The sound voices a plethora of essential tonalities, derived from all the range of life. Animal and human life traces, dissolute in possessive frequencies connecting the psyche to a blurry, unnerving source. Every track has a duration of 7 minutes sharp. “Emanation” has a regular clock-like beating that attempts to regulate the fluctuation of the changes in flesh and spirit; along with it, a necromantic voice summons extra-corporeal elements which would seemingly reconstitute an extrasensory shape of the former being. Pantheistic approaches to the understanding of the world figure that there are no changes between a thing compared to another, but only changes related to the features of things. Under this perspective Death becomes akin to re-qualification to another state of art; and hearing “I Lure Rot”, the third dream, physical extinction is perceived as being only a detachment from the flesh: tinged electrical industrial appeased in fathomed larvae ambiance. The more you fall into the multidimensional labyrinth this musical narration constructs, the deeper your mental feedback feeds on the very memories you had been installing – unconsciously or not – within the futile framework of the mind. And you see clearly that you have, as you ever will, hear the same sounds but cocooned on different level of quality or quantity. The capacity to absorb is in direct connection with your acceptance of being absorbed, losing yourself as individual. Such is the image of the “Devourer”, the Raja Naga, coiling around you in serpentine loops and covering the senses, the primal masters of self-illusion: and this iconic portrayal is being painted on the fourth dreamscape. The former ritual of musicophagia convoluted up to the point of dematerialization that leaves room now for a sacred game of the de–substantialized body present in “Ulterior”. It is now a flash-echo atonality verging on the dissipation of sound frequencies, simultaneously floating in more than one possible spatiality. 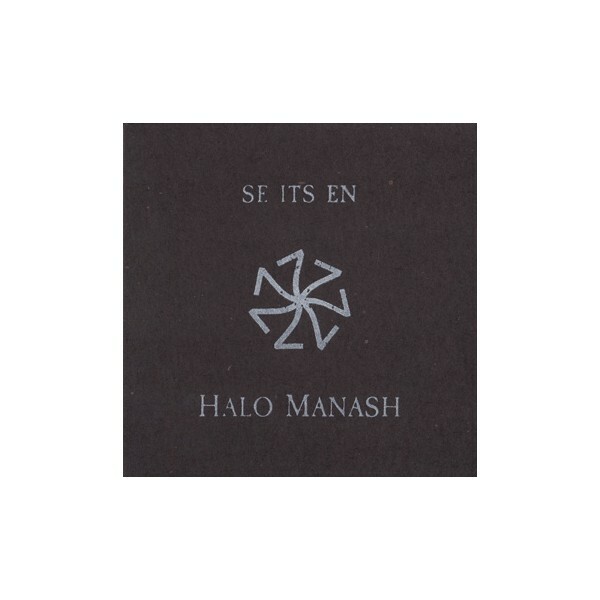 Halo Manash are using energies we are here to understand by their final conveyance through their music. As with other underground phenomena they are not to become popular and certainly not willing to, albeit their innovative and profound explorations are of the same value with other forms of synesthesia. “Mania Tone” elucubrates on the juxtaposition of high levels of energies creating a fascicule-resending keyboard reminiscent of the visionary work of Scriabin on the sound/color rapport and his clavier à lumieres machine. The “Lunar Horn” responds in a parallel, mirrored sounding to the blowing in the first song. The night register of crawling tonalities eschew in fainted drones the remaining sources of light, and finally consume all traces of the sun. The final dream creates irremediable tensions within the listener by the very absence of harmonic differentiation. The oneiric climate legitimates the heavily surrealistic ambiance of the pieces, and exempts the listener of intentional personal explanations. Besides this failure in opening meanings to such a tremendous work, everyone is left enriched with a mind- and body-breaking experience that every one of us will probably have to repeat or just dream again.